In Finland we like to play frisbee golf and it is a growing hobby and even competition sport in Finland. Many new tracks has been built in Finland only in couple of years and they are still building lots of new tracks in different cities. Frisbee golf is a sport where you can chill with your friends and maybe have couple beers while playing or you can go pro and try to compete with the best players in Finland. There are even competitions where players are coming further. For example there is always some players from canada etc. I play it as a hobby for spending time with my friends and enjoying summer. In Finland there are many great motorsport drivers and people working with motorsport. In Formula 1 there has been 9 drivers and two of those, Kimi Räikkönen and Valtteri Bottas, are still driving. We have also MotoGP drivers Mika Kallio and Niklas Ajo. Couple succeeded teams also come from Finland, Koiranen GP in GP3 and Formula Renault, Ajo Motorsport in MotoGP. We have even champions in WRC rally and about 10 drivers in history. I think Finnish people have great drivers in every motorsport because most of them start very young. Even I myself have been driving a car since 6 years old. And the wheather conditions are so shifty that you will learn to drive on either dry, wet or snowy surfaces. My favourite driver is Kimi ”Iceman” Räikkönen and I have watched every F1 race in this year and in couple of years before. There are loads of fine posts about Finnishness and I think they have brought up all the major points of Finnishness so let me share my view of the Finns themselves so that you can have a further understanding of what means to be a Finn. I remember when I was in Rome for a holiday in February few years back and when we came back I was in a light trench coat and in ballerinas for it had been a spring in there. Anyway when I stepped outside the Helsinki-Vantaa station I noticed it was snowing outside. And in that moment I realized that I was back home. I was freaking freezing standing there in ballerinas but I couldn’t care less for it was snowing. I had to travel in the trunk of our car because we didn’t have enough space and it was so cold because there were no heaters. But the funny thing is I was actually overjoyed. It had been this beautiful and warm spring in Italy but sitting there slowly freezing I was happier than I had been on the trip. 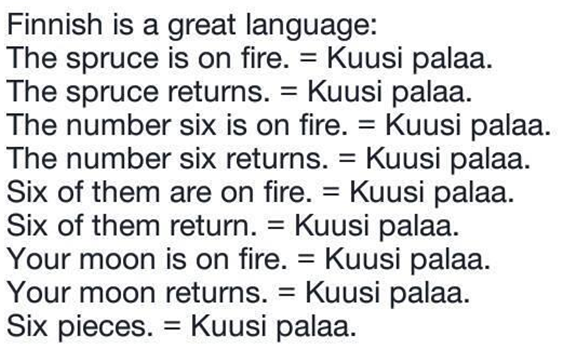 That is something so Finnish that I don’t know whether to laugh or cry. I think our nature has a huge impact in our customs. We have large forests that last as far as eye can see, thousands of lakes and acres after acres of farmland that glows golden in the autumn sun. Yes, the nature is magnificent, yet a bit scary and lonesome. And the people who have grown within these forests are also a bit gruesome, proud even and for sure love their personal space, but they are also warm and caring when it counts. And we are stubborn. And it is not just that we don’t like to admit that we are wrong. We kind of have this principal to not listen to anyone, especially outsiders, when it comes to choices that regard our own life or any choices now that I think about it… But it also unites us. We stubbornly claimed that we are not Swedes and we will not become Russians so we must become Finns. Nowadays the nationalism has calmed down a bit and isn’t any more so dramatic that it used to be. These days we cheer for our sport teams and athletes and are joyed if they win, extremely so if our hockey team wins the world championship. We bicker amongst ourselves but defend each other against everyone else if there’s a need. Oh, I almost forgot to mention we also don’t care what others are thinking about us and actually encourage the clichés about us. And in the process we make fun of everyone thinking like that. It raises our spirit. I think that is enough for now, keep in mind that this is just my opinion of us and maybe it’s just us in Häme who are slow and stubborn. But hopefully this has given you a new aspect of thinking. Personally I don’t trust anyone else’s opinions and prefer to make my own choices, but suit yourself. Wow, I guess I just proved my point. I’d like to think Finnish people are hard working and honest. We respect silence and our own boundaries. Maybe just because of that there is one summer cottage for almost every 10th of people living in Finland. That is where most Finnish people tend to spend most of their holidays, with the nature in silence. Sauna is a traditional place for us. That is pretty much the only place where those boundaries that I mentioned earlier does not exist. You go to sauna naked to sit side by side enjoy the heat with strangers, friends or family. Seasons in Finland varies so much! In summer it gets really warm and the days are really long. In fact in midsummer the sun doesn’t set at all! However summer is short in Finland and the autumn kicks in really fast and hard. Sunlight is not really a thing in Finland during the autumn and winter. Days are really short and when there should be sunny it’s mostly just really cloudy, foggy and cold. It’s quite depressing but when the spring starts and the sun starts showing again it really brightens every ones moods. Being a finn isn’t just about blond hair and pale skin. It’s about being who you are and be proud of it. In Finland, we are able to represent our own values and respect others: one could say that equality and respect are the foundation of our society. In my point of view that’s what makes Finland such a great place to live and which should always be remembered. When it comes to respecting others, the most showing part is that space-thing. One meter between friends, two between strangers, preferably hundred between houses, that’s how we’d like it to be. When the population density reaches 2 people per km2, it gets easier to breath and feel yourself. 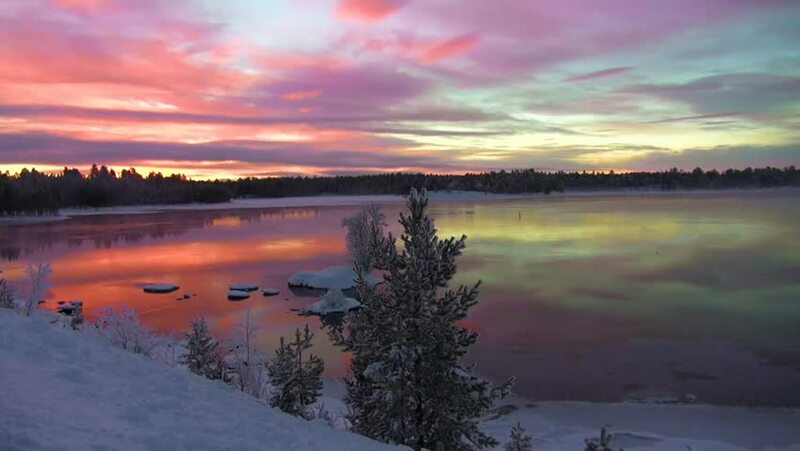 What a pity that this is possible mainly only in the Lapland (picture under) or Karelia. Even though finnishness is often associated with stubborness, it doesn’t mean that we would try to hold back developmet. We have our school system (one of the best in the world by the way), universities and reseach centres. Every now and then some finnish or partly-finnish invention comes up and everyone’s all crazy about it. So quite important part of finnishness is finding new ways of doing things. Not being stuck to the old ways. In addition, Finnish people doesn’t answer clearly with Yes/No. Their answer is often described with longer sentences without conclusion. We Japanese also prefer not to state Yes/No to keep the conversation very flat with each other. Discussion is rarely occurred during casual meeting with friends. Finnish finds more culture in their lifestyle and from nature. Such as Sauna, Nordic designs , Fabrics, and social welfare. For example, marimekko’s fabric design is always inspired by Finnish nature. Work-life balance is concerned so importantly by having more rights to choose what the employees wishing, thus Family can spend more time together. I think it comes from the severe and long Finnish winter when people have to spend most of the time indoor. And they have to collaborate each other effectively so that they will not die in long winter. Finnish lifestyle became role model for some countries like Japan, and lots of Japanese people are fascinated by its effectiveness and comfortableness. I was also helped by this life style throughout my Uni life. I have never had extreme stressful time because the nature was always close to refresh my mind, and school gives student always chance to recover our studies by the great system of student councillor and retake. And this is what i like about Finland but at the same time, makes me wanting more to see arts and architectures in cultural city by traveling another countries. Entrepreneurship is always a hot topic in Finland. Slush Helsinki, and Tokyo is getting bigger, where investors and start-ups gather together to network and create new business contract. And students are always encouraged to involve to these startup events for free as volunteers. The reason why Slush was founded is quite interesting to find Finnishness in the business side perspective. « Slush » means the wet snow which Finland experience in November, and the event is held around this time to boost Finnish and world entrepreneurs to come up with great business ideas. The message here make people come out from there home to this chilly and wet weather. And it has been a big success, that the event is now held in Japan and China, two of the biggest business market in the world.